While You Are Dining: Wild Salsa for Margaritas, Tequila, and Appetizers! Wild Salsa for Margaritas, Tequila, and Appetizers! 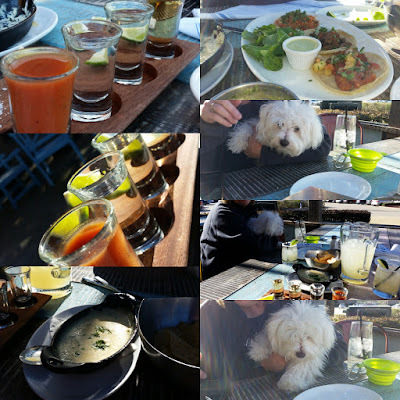 Learned that Wild Salsa has a pet friendly patio last week. So, in short order, it was Wild Salsa for Margaritas, Tequila, and Appetizers! Ordered a pitcher of Margaritas - tasty although not as strong as others (Anamia's, Gloria's, and Village Burger Bar come to mind). No worries, ordered the two flights of tequila they offer. Not sure what there called but easy to remember - they only have the two flights. For appetizers, it was queso and chips, the green chile salsa, and then Tres Tacos - Chicken, Pork, and Beef. Next time will go with the Pork and Beef and maybe the Shrimp Taco, too! Was a fun time, with Charlie the Maltese Puppy providing some great companionship!